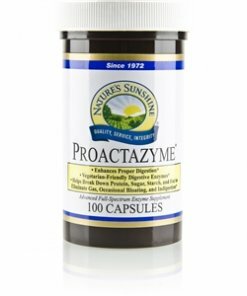 Nature’s Sunshine Proactazyme® Plus provides digestive enzymes that some people may lack. These enzymes assist the body in obtaining the full benefits of dietary nutrients while encouraging proper digestion. The formula includes amylase, glucoamylase, lipase, cellulase, invertase, malt diastase, alpha galactosidase and peptidase. 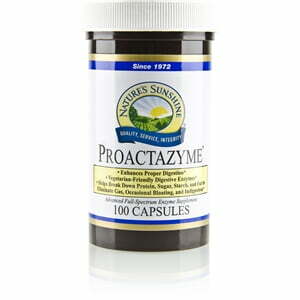 Proactazyme also supports digestion of proteins at 3.0 to 6.0 pH levels with the addition of a protease blend. This product contains only plant-based ingredients so vegetarians can consume it without worry. Instructions: Take one or two capsules with or between meals daily. Beet root (Beta vulgaris), potassium citrate, caraway seed (Carum carvi), dandelion root (Taraxacum officinale), fennel seed (Foeniculum vulgare), gentian root (Gentiana lutea), ginger rhizome (Zingiber officinale), gelatin, and water.